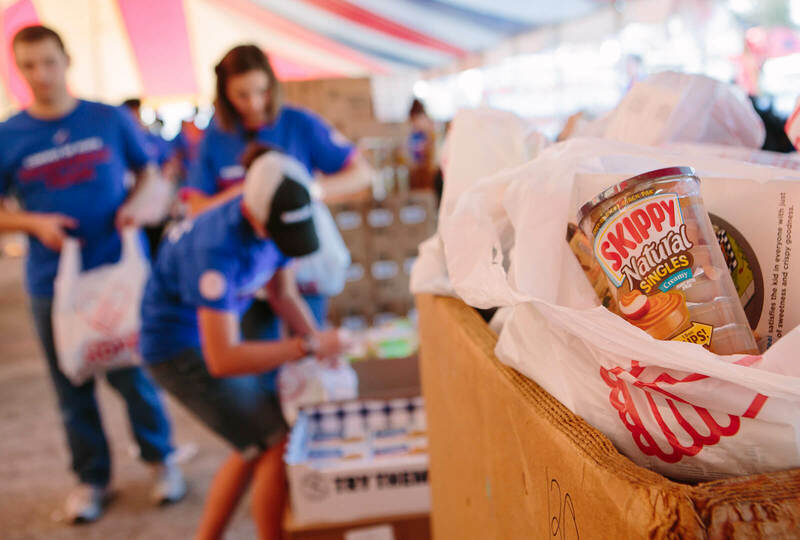 Hormel Foods has been a partner of Convoy of Hope for several years, sending resources to help the group stage community events that give people an opportunity to get services otherwise out of their reach. “Groceries and even haircuts,” says Kelly Braaten, manager of external communications for Hormel Foods. The relationship expanded recently when the company jumped at the chance to stock Convoy of Hope’s warehouse shelves, giving the group much-needed supplies for its disaster-relief program. “We sent protein-rich, shelf-stable products, such as SKIPPY® peanut butter, Stagg® chili, Hormel® premium chicken breast and SPAM® products,” Kelly says, adding that Hormel Foods companies Applegate and CytoSport have also donated products to the group. The deepening of the partnership came at the right time. Earlier this year, the company’s products were used to respond to tornado-relief efforts in Mississippi and Missouri, and flood relief efforts in Wisconsin and Illinois. Convoy of Hope was also able to hit the ground running Aug. 25, responding to Hurricane Harvey and the devastation it brought to Houston and the Texas Gulf Coast. “I’ve had the great opportunity to work with Hormel and it’s just been a wonderful experience. I was on calls with different Hormel staff members, and I shared with them two descriptive terms about the Hormel relationship. One is ‘unique’ and the other one is ‘special,’” says Convoy of Hope’s procurement director, Bill Whitworth. Drew Osier, a customer executive for Hormel Foods in Houston, felt the spirit firsthand. Though his neighborhood fared relatively well, he was surrounded by others that didn’t. Still, roads leading out of the suburb of Cypress where Drew lives were flooded, forcing him to stay cooped up in his home. The upside was when he ventured out, he finally got to meet his neighbors after moving to Texas in June. “Everyone is so together and unified right now. People are people, and we’re going to help each other no matter what,” Drew says. That’s no small task, especially in the wake of Harvey. To add to the challenge, Irma hit Florida several weeks later, but Convoy of Hope was ready for it, something that makes Bill again grateful for Hormel Foods. As for Drew, a native of Austin, Minn., where Hormel Foods is headquartered, he’s been enriched by what he calls “a massive people-helping-people moment.” He’s also become grateful for something he never thought he’d appreciate. “I’ll take a blizzard any day,” he says.